I’ve always been into crafting. When I was little I used to needlepoint and cross-stitch. My mom was a huge influence back then. My friend, Sue Angebranndt, of Green Chair Press (http://www.etsy.com/shop.php?user_id=71723) convinced me that all I had to do was take some pictures and make a banner ad, and presto! I’d have an Etsy page. I’m very active with the San Francisco Center for the Book. I’ve been in lots of shows in the Bay Area and beyond. 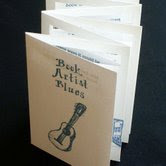 For a long time, I was editor of the etc., a Pacific Center for the Book Arts (PCBA) bimonthly newsletter. I also participate in book arts fairs in the Bay Area: PCBA Book Arts and Printers Fair, Book Arts Jam, SFCB Steamroller, and a few more. Yep, I’m a Special Education Teacher at the continuation school in South San Francisco. Learn how to make your product well. Yes, and not locally too. I’ve been in shows in New York state and Colorado. Oh, my god, do I have to cut all that paper down!? 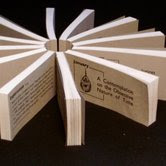 I took a class on Book Design, and I heard about this place called San Francisco Center for the Book and this thing called, Book Arts. So I signed up for Bookmaking I and took that and loved it. While I was in the class, I heard about a woman named Betsy Davids, who taught at the California College of Arts and Crafts (CCAC). I decided to apply for an MFA in Creative Writing at CCAC, because I wanted to do Book Arts and study with Betsy Davids. I took a class with her, we became friends, and now I use her press (a Vandercook SP-15) out in Berkeley. I started bookmaking around 2000. Since then, I've made books that are for sale with Another Room Book Arts (http://www.anotherroombooks.com/), Vamp and Tramp (http://www.vampandtramp.com/html/home.html), and The Stop at Minnesota Center For Book Arts (http://www.mnbookarts.org/theshop/theshop.html). 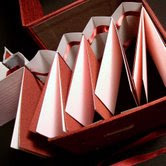 I like this structure I learned from Kumi Korf, a book artist and architect in New York, I’m not sure what it’s called. It’s a series of books sewn to an accordion. Some people say it looks like a roman shade.